About Finder: Choose this command to find out which version of the Finder is running on your Mac. This menu item isn’t particularly useful — or at least not for very long. But when a different application is running, the About Finder item becomes About application name and usually gives information about the program’s version number, the developers, and any other tidbits that those developers decide to throw in. Sometimes these tidbits are useful, sometimes they’re interesting, and sometimes they’re both. 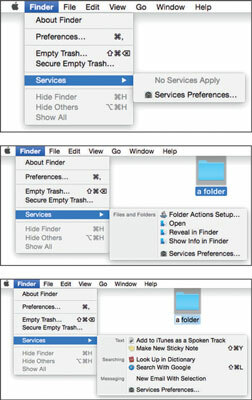 Preferences: Use the choices here to control how the Finder looks and acts. Services: One of the really cool features of OS X applications is the accessibility of Services. If nothing is selected in the Finder, the Services menu is empty, as shown in the top panel. When an icon or icons are selected, there are four Services you can choose, as shown in the middle panel. Finally, if a word or words are selected, you have five different options, as shown in bottom pane. In other words, the items you see in the Services menu are context-sensitive, so what you see in yours will depend on what you have selected. If you look in the Services menu and don’t find anything interesting, try selecting something else and looking again; you might be pleasantly surprised. Choose the last item in the menu, Services Preferences, and you can enable dozens of useful Services that aren’t available by default. Hide Finder (Command+H): Use this command when you have Finder windows open, and they’re distracting you. Choosing it makes the Finder inactive (another program becomes active) and hides any open Finder windows. To make the Finder visible again, either choose Show All from the application’s self-named menu (the one that bears the name of the active application, such as Finder, TextEdit, System Preferences, and so on) or click the Finder icon on the Dock. The advantage to hiding the Finder — rather than closing or minimizing all your windows to get a clean screen — is that you don’t have to open them all again when you’re ready to get the windows back. Instead, just choose Show All (to see all windows in all apps) or click the Finder button on the Dock to see all Finder windows. Hide Others (Option+Command+H): This command hides all windows associated with all running programs except the active program. It appears in most applications’ self-named menu and is good for hiding distractions so you can focus on one thing: the unhidden application. Another easy way to hide all open applications and windows while activating the Finder is to hold down the Command and Option keys and click the Finder icon on the Dock. This technique works with whatever application is active, not just the Finder. So if you’re surfing the web and decide you want to see only Safari’s windows on your screen, Command+Option-click the Safari button on the Dock, and it will happen instantly. Show All: Use this command as the antidote to both of the Hide commands. Choose this, and nothing is hidden anymore. Note that all three of these commands require that at least one application be running in addition to the Finder. Put another way, when the Finder is the only app running, these three commands are grayed out and unavailable. You can achieve much the same effect as all this hide-and-show jazz with Mission Control.